The Fourth World Internet Conference opens in Wuzhen, and world famous Internet big shots including chairman Xi gathered together to talk about the future development of the Internet. Lei Jun, founder, chairman and CEO of Xiaomi, and Li Yanhong, co-founder, chairman and CEO of Baidu Inc, communicated at a forum on AI during the fourth World Internet Conference, also known as the Wuzhen Summit, in Wuzhen, East China's Zhejiang province, on Dec 4, 2017. The fourth World Internet Conference's forum on artificial intelligence has become a spotlight in Wuzhen.Participants have a panel discussion on technology and industry of AI at the forum with the theme of "Artificial Intelligence: Smarter World, Better Life" during the Wuzhen Summit. China is encouraging other countries to board the express train of its internet and digital economy development, President Xi Jinping said on Sunday. Xi made the remark in a congratulatory message to the opening of the Fourth World Internet Conference in Wuzhen, Zhejiang province. With a theme of "Developing Digital Economy for Openness and Shared Benefits - Building a Community of Common Future in Cyberspace", the three-day conference will facilitate discussion on issues such as the digital economy and cyberspace governance. Apple Inc's CEO Tim Cook delivers a speech at the opening ceremony of the Fourth World Internet Conference in the Wuzhen. He said that his company is proud to have worked with partners in China to help build a community that will join the common future in cyberspace. "Developing a digital economy for openness and shared benefits is a vision we at Apple share," he told the gathering. Cook said Apple will make its coding language Swift, accessible and open to all, allowing a new generation of firms from China or abroad to pursue their dreams. "In order to build the common future of cyberspace, we must embark on a new era of global cooperation and new partnerships," said Chuck Robbins, chief executive of network equipment supplier Cisco Systems Inc.
Jack Ma, Alibaba Group's chairman, leaves the stage after delivering a speech at the opening ceremony of the Fourth World Internet Conference in Wuzhen. 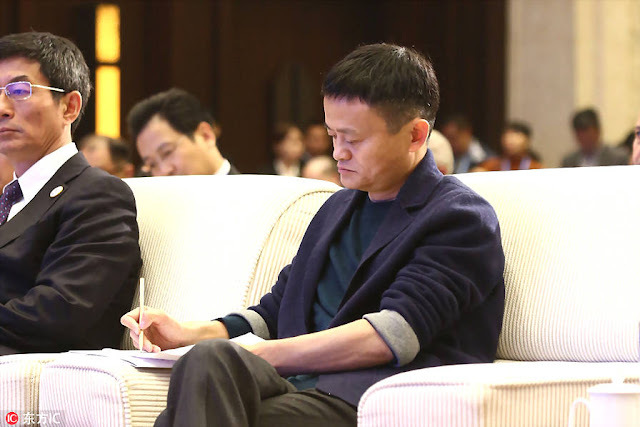 Jack Ma, chairman of Chinese e-commerce giant Alibaba Group Holding Ltd, said that internet companies, as the darling of the times, ought to shoulder the tremendous responsibilities of winning the market through innovation and earning respect through the spirit of sharing and inclusiveness. "We should take the initiative to embrace technology to enter into a sharing, inclusive and green era," Ma said. As Xi said "China will never close its doors. They will only be opened wider and wider going forward."